Clinton Avenue is arguably one of the most majestic street in all of Brooklyn. This beautiful tree lined street is home to many mansions that still maintain their integrity because many of the owners have shown great respect and reverence for their original splendor. Many of these grand homes, particularly on this block where “419” sits have not been subdivided, condo’d, or co-opped. They have maintained their historic character. 419 Clinton Avenue, built in 1930 and home to the same family for over sixty years is a remarkable gem, waiting for a family to transform its many resplendent features into their dream home. 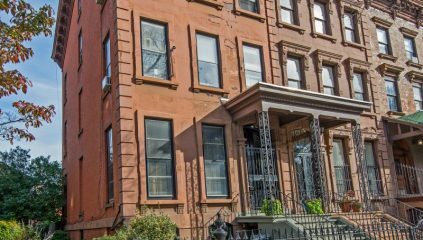 There are seven marble mantels, mahogany wainscoting, original tin ceilings, shuttered windows in spacious rooms with twelve foot ceilings and a lovely garden area. Currently used as a three family unit with owner’s duplex, this home can easily be restored to a one family mansion if your needs dictate the use of 5,500 square feet of living/work space; or, renovated as an owner’s duplex with two rental units with excellent revenue…..A host of possibilities….All great…..You choose. By appointment only.